Children living in the Gaza Strip are experiencing unusually high rates of nightmares and are showing increasing signs of psychosocial deterioration as a result of the violent response to the Gaza protests, just over a month since they began. 56 per cent of Palestinian children surveyed by Norwegian Refugee Council (NRC) in March were suffering from traumatic nightmares. When repeating the survey preliminary findings indicate an increase to 60 per cent, a month into the Great Return March demonstrations during which more than 38 Palestinian protestors have been killed, including 4 children and 2 journalists. More than 6,400 Palestinians have been injured, including at least 530 children, many of whom are left with amputated limbs and permanent disabilities. Principals from 20 schools interviewed by NRC reported a rise in symptoms of post-traumatic stress in children, including fears, anxiety, stress and nightmares. School principals attributed high levels of post-traumatic stress and low concentration at school to the violent response to the demonstrations. The principals ranked increased psychosocial support in schools as their top need right now. NRC provides psychosocial support to children and training for teachers through its Better Learning Programme (BLP), developed in partnership with University of Tromsø in Norway. Part of the programme involves screening schoolchildren for nightmares, which are one of the most pertinent signs of psychological deterioration. The activities include training children to do breathing exercises and drawing their dreams. “For the children we work with, the nightmares continue for months and years after the violence that causes them,” said Jon-Håkon Schultz, Professor in Educational Psychology at the University of Tromsø in Norway who has participated in the implementation of the BLP programme in Gaza since 2012. He underlines that these nightmares are traumatic nightmares where the child wake up in fear. 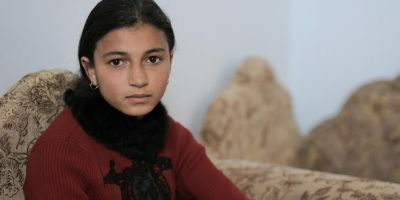 Reham Qudaih, 14, was showing remarkable improvements in dealing with the trauma of the 2014 war on Gaza until her father was shot in the leg during the demonstrations. She is now having daily nightmares in which she dreams that her father is dead or had his leg amputated. The widow of Jehad Abo Jamous – killed at the demonstrations – told NRC how her 4 children are waking up crying and screaming at night. “They feel disconnected from everything and refuse to eat or drink,” Ghadeer said. Mohammed Ayoub, 14, was getting psychosocial support through NRC’s programme in schools when he was killed at the demonstrations. The sheer force being used against unarmed civilians has also alarmed doctors in Gaza’s hospitals who are receiving increasing numbers of people with bullet wounds, torn muscles and smashed bones.